We’ve all heard a variation of this common cry from singers who are rehearsing for a gig or show. Fortunately, we have a solution for it! First you need to ask yourself the following three questions and see what you come out with. This is the most common cause of not being able to hit those high notes. If you didn’t warm up properly before or at the start of the rehearsal, then you aren’t going to be able to hit those high notes properly. See our blog post on why warming up your voice is important. Are the other instruments at a regular volume? If you are rehearsing with a band, check that the amp and bass on the guitars is not turned up too loud. In a small rehearsal room, this can affect your hearing and make you feel like you need to sing louder to compensate for how loud the instruments are. Too much vocal volume can cause you to struggle with the high notes, as they are harder to hit spot on when you’re singing loudly! Is the microphone turned up enough? Again, if you are rehearsing with a band, check that your microphone is turned up enough so that you can be heard over the instruments. If your microphone is too quiet, then it may be very difficult to hear yourself, so you end up overcompensating with volume. If you can answer no to all three of these questions then you’ve just hit the nail on the head on why you are finding the high notes impossible to hit in rehearsals. Even just answering no to one of these three questions could pose a problem to you when you are rehearsing. Not warming up properly is the biggest culprit when it comes to hitting those high notes with ease. 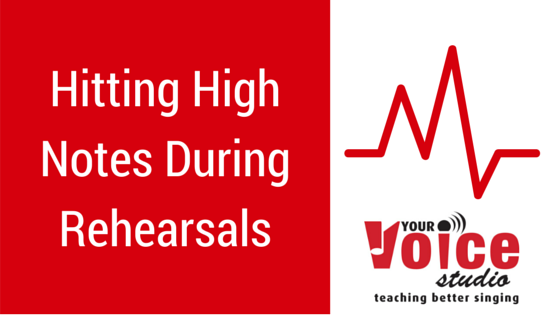 If you are having to compete with instruments when you are rehearsing then you absolutely must warm your voice up first to avoid injuring your voice. A good singing teacher will be able to tailor a warm up track for your voice so it helps you to get to your optimal vocal balance before you start rehearsing. If you have warmed up thoroughly, then make sure that the instruments are at a regular volume level and your microphone turned up so you can hear yourself over the others. This will help to stop you feeling like you need to sing too loudly to be heard. The other thing you can do to help yourself if the instruments are too loud, is to get an in-ear monitor. You can also use this when you are doing gigs too, so if you can afford it it will be a worthwhile investment! This will help you to hear your own vocals without the noise of the band, which means you can keep an eye (or ear!) on the volume and accuracy of those high notes. Can I normally hit those high notes with ease? If you struggle to hit those high notes normally, then hitting them in a rehearsal space is going to be even more difficult with the added adrenaline. If you are finding the high notes difficult then maybe it’s time to find a singing teacher that will be able to help you before you can hit them in that free and easy way that you want to. Remember, strings on a guitar can be replaced if they snap, but you only get one set of vocal cords! So look after them, and don’t be persuaded to do otherwise! If you struggle with hitting high notes at rehearsals, at your next session try out these three things and let us know how you get on. Chances are your life will be made easier and those high notes will not be as much of a problem. Connect with us on social media or in the comments below and let us know if this was helpful for you!